This statement makes faith a fundamental virtue of the Christian life. Our God operates in the realm of the spirit, and so when He speaks, His words come across as foolishness to the natural man (1 Corinthians 2:14). How do you believe something that appears foolish? How can a natural man believe in what the senses cannot comprehend? Well, glory be to God, our Lord knows our frame and understands the limitation of the natural body we inhabit (Psalm 103:13-14). It is for this reason that He sent the Holy Spirit to live within us, thereby empowering us to live above our limitations (Romans 8:11, 26). It takes walking with the Holy Spirit to rise above the senses and operate in the realm of faith. Faith is the nature of the Holy Spirit, and so those who cultivate a relationship with Him are enrolled in the school of faith where their faith is developed to the level where they effortlessly manifest the character of faith (John 14:26). Faith in God opens the doors of possibilities beyond the wildest imagination. May the Lord make you an embodiment of faith and meekness ion Jesus’ Name. Prayer Point: Sweet Holy Spirit, You are my Teacher; teach me to rise above the limitations of my senses into the realms of faith, and help me to operate in Your power with meekness. Flatimes’ Notice Board: Please do not prolong your salvation if you have not repented. Many are going home daily and tomorrow maybe too late. Open Heavens 26th January 2018, Daily Devotional guide was written by Pastor E.A. 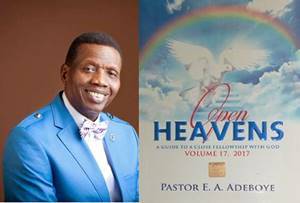 Adeboye, the General Overseer of the Redeemed Christian Church of God, one of the largest evangelical church in the world and also the President of Christ the Redeemer’s Ministries.